Shorter days. Cooler nights. A gardener’s fancy turns to thoughts of bulbs: What’s new this year? How can I boost color in the spring? How do I extend my bloom time? Solutions abound at the Fall Bulb Festival, the area’s largest and most diverse bulb marketplace. The annual event sells more than 200,000 bulbs, from tried-and-true performers to more exotic varieties appealing to the connoisseur. Gardeners seeking early signs of spring will be happy to see Crocus chrysanthus ‘Blue Pearl’ among this year’s offerings. It’s a favorite of horticulturist Tom Weaver, who oversees the Graham Bulb Garden. The pretty flower—pearlescent white, flamed with blue—brightened the Bulb Garden lawn last spring. It’s also a good candidate to use in perennial borders, under trees and shrubs, and among ground covers. Another newcomer, Narcissus ‘Frosty Snow’, builds in variety and interest with its color-changing ways. White petals open around a yellow cup, which slowly shifts from white with a yellow rim to pure white. “It’s almost like getting three flowers with one bulb,” Weaver said. Tulipa x kaufmanniana ‘Early Harvest’ interplanted with scilla and Narcissus (yet to bloom). 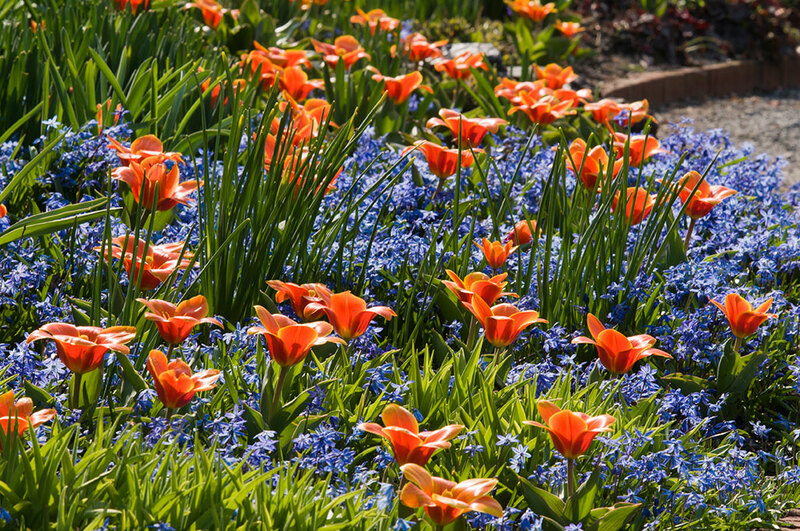 The deep orange of Tulipa kaufmanniana ‘Early Harvest’ can bring warmth and vibrancy to a spring garden, according to Weaver, who recommends partnering the “intensely” orange blooms with a blue anemone (Anemone) or squill (Scilla). ‘Early Harvest’ also offers a more compact height and perennializes well, making it a better bet to return year after year. A vivid garden palette might benefit from Hyacinthus orientalis ‘Pink Elephant’. Its large, fragrant flower spikes are the palest pink tinged with salmon. Such faint pastels and whites can have a calming effect in a garden and give the eye a place to rest, according to Weaver. 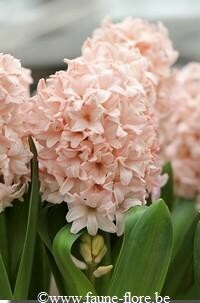 Companion planted with a coral-cupped narcissus, ‘Pink Elephant’ could also be used to create a nostalgic feeling. Allium ‘Pink Jewel’ can step up in early June, right after the tulips are done for the season. “It fills in the gap when there’s not a lot blooming,” Weaver says. The 6-inch flower clusters are composed of cheerful raspberry-sherbet pink florets with bright green centers. Can’t wait for spring? 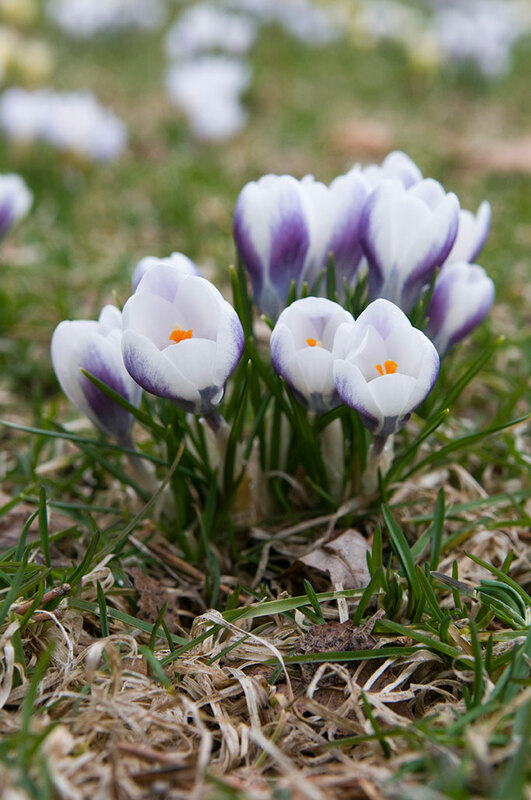 Pick up a fall-blooming crocus and plant it as soon as you get home. New among this year’s offerings, you’ll find Colchicum ‘Violet Queen’. The large blooms combine beautifully with ground covers, providing a rich, purple color in September and October. ‘Violet Queen’ is pest resistant and naturalizes readily. Expert staff will be on hand this weekend to describe the hundreds of tulips, narcissus, and specialty bulbs available. Explore diverse growing options, and discover innovative ways to incorporate bulbs into your garden design.